Housing is a personal story about micro-markets. This is why headlines about averages often confuse. 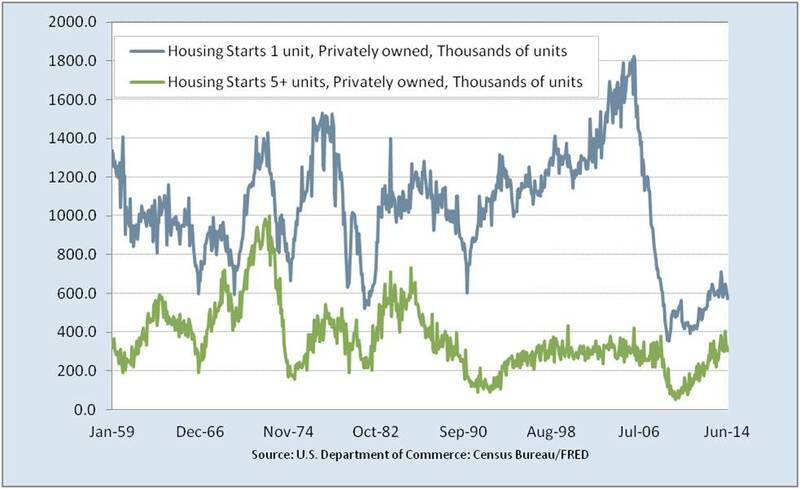 How hot is housing? Before digging into dirt, dig into data (July 2014) pictured how housing investment and prices are still at historical highs, other than the big bubble. First, notice that 5+ unit starts are strong compared to 1990-2007 ranges. 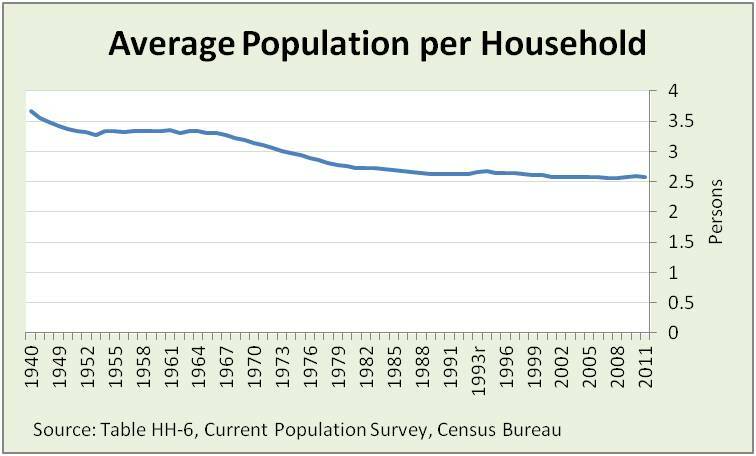 Single family is historically low. 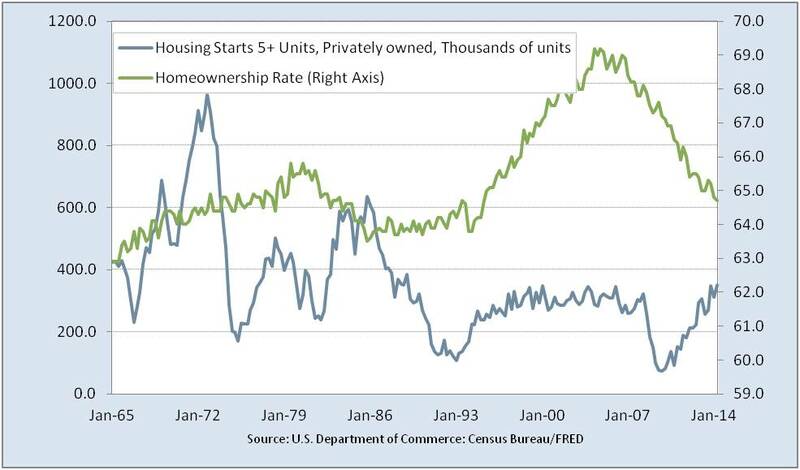 Second, multi-unit housing is growing as home ownership rates fall. Yet, home ownership rates started to fall 2 years before the bubble burst and are historically reasonable compared to levels before the bubble began in 1995. Third, differences in unit size of housing structures illustrate two broad markets. Single family new house average size has grown 44% since 1987. After falling significantly after the bubble burst; today they are almost back on the historical trendline. 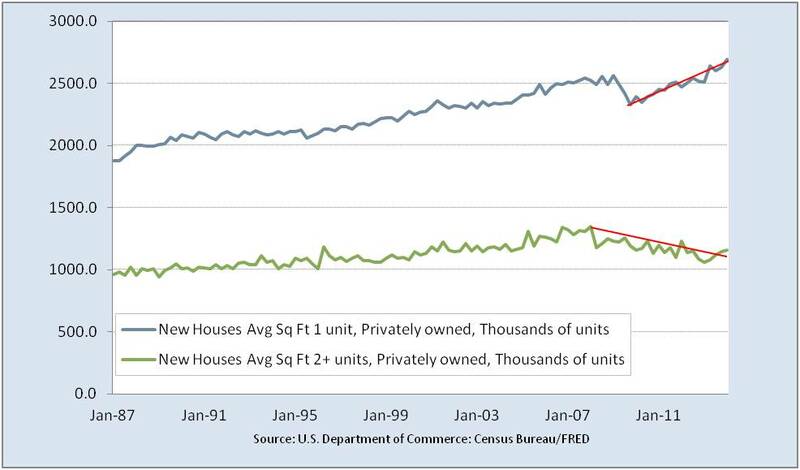 By contrast, multi-family average size has grown 20% since 1987. After falling moderately after the bubble burst, average size is up over the past 18 months. Finally, these changes in average square feet are happening while average household size has been dropping. Thus, effective unit size is even larger in terms of square feet per person. These pictures reinforce the message that people – on average — are consuming housing at a historically solid pace, just not at bubble levels. As discussed in How hot is housing? Before digging into dirt, dig into data (July 2014), caution should be exercised in expectations of higher housing prices or greater total investment unless it is caused by a surge of spending from the wealthy or global investors into the US. If higher prices or investment come from excessive credit, then credit brings problems. There are two broad growth markets: 1) historically fewer completions of significantly larger average single family houses and 2) historically solid completions of slightly larger average multi-family houses. These reflect two ways strategically sharp builders can grow. As always, housing is local, so “strategically sharp builders” means the right units on the right properties. Next Article Is this the Fed’s inflation trap?